It's clear from various video footage that large crowds of protesters are defying the overnight curfew. That imminent public address supposedly coming from Mubarak an hour or so ago still hasn't happened. I never thought I'd see such scenes in the city I thought of as home for so many years. It was always so laid back, so peaceful and relaxed. I guess things have been simmering away for some time for it to suddenly come to this with little apparent warning. Egyptian state television reporting that overnight curfew has been extended to all cities in the country. Medical sources are telling Reuters that there are now 410 wounded in Cairo, some of them with bullet wounds. CNN says police station in Alexandria has been set on fire. 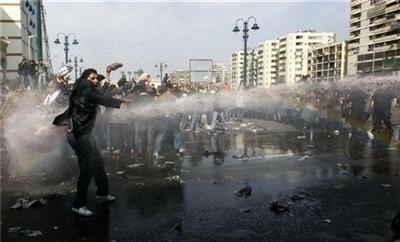 AP reporting that thousands of protesters are trying to storm the foreign ministry and state TV buildings in Cairo. chant, "The people and the army, we are one." Al Jazeera reporting that the offices of the ruling NDP in Cairo and several other cities in Egypt have been set on fire or attacked. CNN reporting that "treaded tanks" now on streets of Cairo. As in, a more heavy-duty military vehicle than seen so far. A witness tells Reuters that the Egyptian army has repelled hundreds of protesters who attacked the entrance of a central bank building in Cairo. The BBC reports that a BMI plane travelling from Heathrow to Cairo was turned round mid-flight. Other flights to Egypt have been cancelled due to the rapidly changing situation. I wouldn't compare the situation in Tunisia, Egypt and many other countries in the Arab world with the one in Greece. I don't know how? how? without any political party backing...without any front face....People is going to change the face of a nation....it is time to Arab world to change.....change before its too late.......change for your own people.....change for development.....change for a better future of Muslim world. what is built fake will stay fake even if it takes 30 years to realize it, thats our situation in the Arabic countries. Thank u Facebook, thank u twitter, and of course Reuters. More now on that BMI flight turned round mid-flight between Heathrow and Cairo. A statement released by the airline reads: "Due to the rapidly changing situation in Egypt, British Midland International flight BD771 which was en route to Cairo is returning to London Heathrow." The plane was carrying 64 passengers and six crew. why aren't we hearing from the US till now? President Mubarak has chosen a Vice-President for the first time since he took office in 1981, appointing his intelligence chief and confidante Omar Suleiman to the post. State TV has apparently shown Omar Suleiman being sworn in as Vice-President. As President Mubarak refuses to bow to demands that he resign, heads of state and politicians have offered their take on the situation. "He (President Hosni Mubarak) pledged a better democracy and greater economic opportunity. I just spoke to him after his speech and I told him he has a responsibility to give meaning to those words, to take concrete steps and actions that deliver on that promise." "Violence will not address the grievances of the Egyptian people and suppressing ideas never succeeds in making them go away." "What's needed now are concrete steps that advance the rights of the Egyptian people, a meaningful dialogue between the government and its citizens and a path of political change that leads to a future of greater freedom and greater opportunity and justice for the Egyptian people." "He (Mubarak) must seize this moment to make these reforms real and visible and to base them on the universal values that are the right of people in all countries." "We are working with our EU partners and other allies on the latest developments to deliver a clear coordinated message about our expectations of President Mubarak and in particular the need for him to take responsibility to deliver change. Peaceful reform not repression must be the way forward." "Egypt has to embark on a process of reconciliation and these vast groups of people need to be given a clear vision of the future that is there for them -- jobs, opportunity, education. "But we also see that fundamental rights is mobilizing people to go to the streets, for the right of expression and the right of elections." "I'm struck by the variety of age, of class, of gender, (of the protesters) it's across the board, you can see it, you can see the variety of people there. "It's not, from my perception, religiously driven. This is not the Muslim Brotherhood." "The Americans can tolerate seeing bloodshed in Egypt but not see a regime fall in Egypt into the hands of the people,"
"It is crucial that action quickly follows words. Commitment to political and economic reforms goes in the right direction, but must be implemented quickly and consistently. The security forces should not use violence against peaceful protesters." "I reiterate my call on all parties to exercise restraint and calm and I urge the authorities to immediately and unconditionally release all peaceful demonstrators from detention." "I also reiterate my call upon the Egyptian authorities to urgently establish a constructive and peaceful way to respond to the legitimate aspirations of Egyptian citizens for democratic and socioeconomic reforms." "No Arab or Muslim can tolerate any meddling in the security and stability of Arab and Muslim Egypt by those who infiltrated the people in the name of freedom of expression, exploiting it to inject their destructive hatred." "You can describe it as a demographic tsunami to the south of the Mediterranean that can only be met by sustained economic reforms." "It is now even more obvious that what Egypt needs is a political initiative that leads to an open and democratic presidential election later this year." "There is no question, a lot of changes need to take place. "If this process of change is managed well -- and that begins by those in government not being dismissive of the desire for change given the high degree of dissatisfaction with the status quo." As well as the BMI plane being turned around mid-flight on way to Cairo from London, British airways has announced that it has sent an extra plane to Egypt to evacuate tourists. 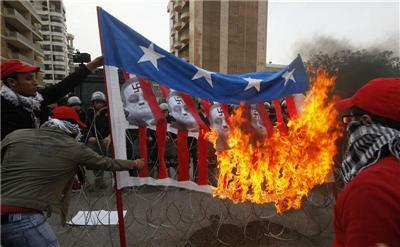 BA has not cancelled flights, but has adjusted its schedule to take into account the curfew imposed by the government. A BA spokeswoman said: We've booked a charter flight that's going in today in order to get as many people out as we can." "This is the Arab world's Berlin moment. The authoritarian wall has fallen -- and that's regardless of whether Mubarak survives or not. It goes beyond Mubarak. The barrier of fear has been removed. It is really the beginning of the end of the status quo in the region. The introduction of the military speaks volumes about the failure of the police to suppress the protesters. The military has stepped in and will likely seal any vacuum of authority in the next few weeks. "Mubarak is deeply wounded. He is bleeding terribly. We are witnessing the beginning of a new era." "I think it will take a couple of days to organize his departure if it happens. It's going to be a messy process and there will probably be some bloodshed. I don't think you're going to get into a situation where you have almost a war with the army on one side and the people on the other. 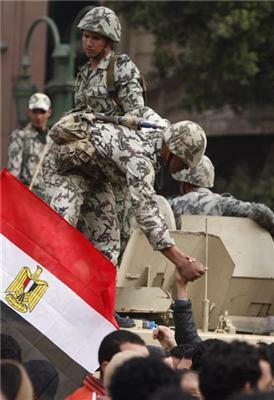 The army has to decide whether it stands with Mubarak or the people. It's one of those moments where as with the fall of communism in Eastern Europe they can come down to individual lieutenants and soldiers to decide whether they fire on the crowd or not. Different soldiers and groups of soldiers may well make different decisions. In some ways what we're looking at is what happened in Iran in 1979, but without (Ayatollah) Khomenei. These protests are much more leaderless. As with Tunisia -- and with Iran in 1979 -- what will probably happen is you get an interim government. The question is what replaces it." "Be careful what you wish for, you may get something worse. The biggest geopolitical nightmare for Israel is to have the most populous Arab country at your doorstep with political instability. Believe me, it changes the whole balance of the Middle East, it makes everything else look very simple because suddenly we go back 30 years." "There is currently a sort of earthquake, nothing less. 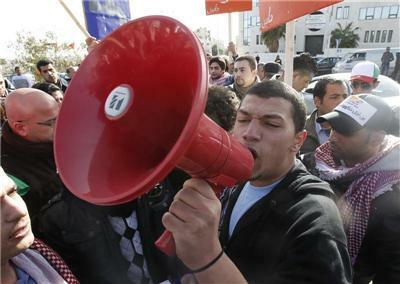 It started in Tunisia, it is continuing in Egypt; the political situation in Lebanon is, in any case, very complicated; in Yemen there are already two straight days of protests which have their own local peculiarities ... it cannot be said that these are just isolated incidents, there is something broader which can be termed the Tunisia or Al Jazeera effect. "Mubarak is showing he is still there for now and he is trying to deflect some of the force of the process away from himself by sacking the Cabinet. In some ways, it is reminiscent of what Ben Ali did in Tunisia before he was forced out." "We will have to see how people react but I don't think it will be enough at all. I wouldn't want to put a number on his chances of survival -- we really are in uncharted territory." Is the appointment of Omar Suleiman designed to ease a handing over of power? This is a popular theory on Twitter, anyway. @sharifkouddous tweets: "Chanting in Tahrir Sq: "Mubarak, the plane is waiting for you at the airport." Witnesses telling Reuters that Cairo residents are panicking over public security.... they hear gunshots and are seeing random fires and looting.